Visitors from around the world travel to Zambia and Zimbabwe year-round to visit the most remarkable waterfall in Africa, Victoria Falls – one of the Seven Natural Wonders of the World. Some people visit during peak season when Victoria Falls is full and roaring, but other visitors will seek for something more than just seeing the smoke that thunders. If you are looking for something more adventurous during your trip to Victoria Falls, I have great news… there are several activities you can enjoy at Victoria Falls and one of them is Devils Pool where you SWIM ON THE VERY EDGE of Victoria Falls. 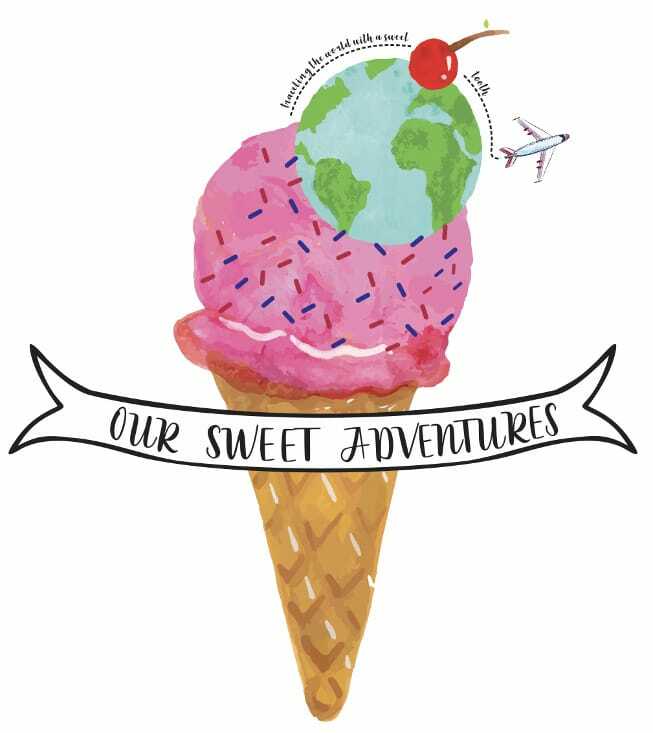 How is that for a sweet adventure?!?! We visited Victoria Falls during its dry season (September to November) and though Victoria Falls is not at its full beauty of water crashing down, it does give tourists like us, the opportunity to enjoy Victoria Falls Devil’s Pool. Devil’s Pool was the most thrilling experience we have ever done and truly a “sweet adventure!” We cannot say enough great things about our experience, but we can say – GO DO IT and we can show you how! What Is Victoria Falls Devil’s Pool? When Can You Visit Victoria Falls Devil’s Pool? Devil’s Pool is a naturally formed pool on the edge of Victoria Falls. It is created when the Zambezi River has low water levels, which allows a rock barrier to be surfaced and forms a circular movement of water with a minimal current. It sounds scary and it is definitely thrilling, but completely safe! Victoria Falls Devil’s Pool is usually open between mid August and mid January – depending on Zambezi’s water levels. We know that a trip to Africa takes months of planning and booking ahead of time, so our suggestion is booking a day to Devil’s Pool as early as September to almost guarantee the experience. No one can predict how dry the Zambezi River will be every year and what its water levels are, but with September being in the dry season, your chances are very high. We went October 4th, 2017 and the water levels for Victoria Falls Devil’s Pool were perfect. This is a very popular activity and sells out fast, so try to book as soon as you can. There is only one company, Tongabezi, that has been issued with an exclusive operators license to conduct the Livingstone Island and Victoria Falls Devil’s Pool tours. There are several off-the-street guides who try to bring tourists to Devil’s Pool, but it is strongly advised to not engage with them. Book safely with Tongabezi (you can also stay at their luxury tree house lodge, click here to read our experience), you are swimming on the edge of Victoria Falls after all, not something to take lightly. So with that being said, Tongabezi is only responsible for the Devil’s Pool tour portion. How guests arrive to Royal Livingstone Hotel (the meeting point) is booked with another tour operator, Shearwater or Wild Horizons. These companies will take care of transportation from a guest’s hotel to Royal Livingstone Hotel. From there guests board a small boat and cruise down the Zambezi River to Livingstone Island. Then from Livingstone Island, you swim across a small current of the Zambezi River till you arrive at a “jetty”. Once there you walk a little ways down and plunge into the Devil’s Pool! As we briefly mentioned, the experience starts at Royal Livingstone Hotel, where you fill out some paperwork, BRING YOUR PASSPORT. Once the paperwork is settled, the tour begins by boat on the Zambezi River to Livingstone Island. The boat ride alone is exhilarating and sometimes you can feel the mist from the falls. Once you make it to Livingstone Island, you are greeted with a warm welcome and a cold drink of a traditional African Maheu energy drink (made with maize meal, milk and sugar). We recommend you take this drink to boost your adrenaline! It does have an acquired taste, but we enjoyed it. Your guide will explain the details of what your tour will entail and give you the opportunity to take photos near the edge of Victoria Falls – if you are lucky, you can see the most magical rainbow (typically during the morning tours and sunny days). Even being near the edge and seeing Victoria Falls adjacent to you was thrilling and yet the experience just kept getting better. Guests will strip down to their desired swim wear while on Livingstone Island. We suggest you come wearing your swim wear with clothes over it. It makes for a quick and easy changing room. We also recommend you wear wet shoes (or any shoes you do not mind swimming in) because there are rocks on the bottom and you never know how shallow or deep some areas of the Zambezi River is. You will also be walking and stepping on rocks along the way to Devils Pool. Your guide will have a wet bag for your phone, camera and wallet, which they will hold the entire time for you, so you can focus on swimming your way over to Victoria Falls Devil’s Pool. The guides truly make the experience as easy and fun for you as possible. They will also lead you to the exact path that is the safest. In some instances, there was even a rope for us to use as a guide and assistance if the current was too much for us. Alas, Devil’s Pool! Guests should be advised that even though they say the current is low, it was still a little tricky to swim in. Again, our guide did an excellent job in giving us the BEST experience because he catered to every guest individually. We all took turns to sit on the edge of Victoria Falls and capture the moment by memory and camera. While one guide is sitting with you on the edge, another guide has your camera to take all the photos you need to relive this thrilling moment. Even while we waited our turn we were living the life! Everyone is still able to swim inside Victoria Falls Devil’s Pool or go up to the edge on the side without interrupting anyone’s special experience. So though you are waiting for the most exhilarating part, guests still enjoy every moment of Devil’s Pool. We would say that everyone got at least five to ten minutes up on the edge, depending on the guests and how scared they were. We felt like we were on the edge for a lifetime, while others in our group had enough after only a few pictures. Time spent at Devil’s Pool also had to do with the group behind us. After a total of about 20 minutes of having Devil’s Pool to ourselves, the next group came behind us. It was all well organized and everyone is on such a high that we were all nice to share the adventure together. When we were up on the edge it was an electrifying and sensational experience – we were seriously hanging off the rocks of Victoria Falls watching the water crash down just a few feet next to us! We could not get enough of the adrenaline coursing through our veins. Christina kept inching further to her near death while Adam was content laying safely on the edge. Though we were in Victoria Falls Devil’s Pool, we were in heaven. Once we were back on Livingstone Island we enjoyed a scrumptious breakfast in a tent with our group and some others. Breakfast included your choice of beverage, a freshly baked biscuit and eggs benedict on an english muffin with bacon. Breakfast was delicious, but the atmosphere was even better. The tent had open windows, so we were able to see the edge of Victoria Falls the entire time. Guests receive breakfast for the 7:30am, 9am and 10:30am Livingstone Breezer tour. Lunch is served for the 12:30pm tour and High Tea is served for the 3:30pm tour. Guests are not rushed to leave, but rather suggested to sit back and relax or walk around and explore Livingstone Island. We definitely recommend that you do both. We walked around the island and though Victoria Falls was dried up, the views were still stunning. The magnitude of how large and high Victoria Falls is mind blowing and even crazier when you realize you are standing in a place where water is typically flowing down. Near one of the magnificent viewing areas is a plaque honoring David Livingstone and his famed discovery. As our tradition goes, Adam was able to collect sand (one of the softest sands) on Livingstone Island to add to our sand collection. Safety is very important. We felt safe during the entire experience – even when we were hanging off the edge of Victoria Falls. Our tour guide was always right next to everyone to reassure and help us with any troubles we may have been experiencing. They were also very friendly and engaging, which we always appreciate. Having the guide next to us on the edge was definitely reassuring that if we were to slip, he would have our backs. With that being said, he never let us do anything crazy – we were not allowed to stand on the edge or hang too far off of it. Again, please do not book with any off-the-street vendors. It is not safe or worth it. You can book directly with Tongabezi (click here) or with Wild Horizons and Shearwater. Pricing includes transportation to and from Livingstone Island, breakfast, lunch or high tea and of course, the Devil’s Pool experience. You do not need an entrance ticket to Victoria Falls. If you are not able to visit Devil’s Pool, do not fret, you may have the opportunity to also live life on the edge at Angels Pool! Angels Pool is another adrenaline rushing natural pool on the edge of Victoria Falls that is typically open before and after Devil’s Pool. For more information click here. SO COOL! I loved reading about Devil’s pool and its definitely in my bucket list. Thank you for sharing. Thanks for the recommendation about Devil’s Pool. Victoria Falls is on our bucket list for sure. Its great to hear that someone else has done this as well. Truly an incredible experience we will never forget. The guides were amazing and new exactly how to take the photos. I have always read about waterfalls making a rainbow but this is the first time I have seen a pic displaying one in its full glory. You will have to go and experience it someday. Truly incredible. I’ve seen so many videos on this Devil’s Pool! You guys are brave, but actually, it doesn’t sound too bad! I’d definitely love to walk around Livingstone and see the wonderful landscape. Just a perfect adventure! The island itself was neat as well to explore. There were times when you are in the pool and you feel like the current is strong and your feet can’t touch the bottom and you start to panic a bit but then you realize there is a wall to stop you and you breathe a sigh of relief. This looks amazing!!! I’ll do it in a heartbeat! That view is EVERYTHING! And to take it in from the edge of a natural pool like that…sooooo perfect! We would rather skip the sharks haha. Believe us that our hearts were racing the entire time! We had no idea until we stumbled upon it while looking at activities at our resort. Once we saw it we knew we had to try it. Wow, I had no idea you could swim up to the edge like that – Yes I am in! haha you’re right, what an adventure. Victoria falls is definitely on my bucket list. Great to hear that you had a good guide aid to Devils Pool, and that he was very helpful and catered to your needs individually. Was it expensive to hire the guide to take you to devils pool? You should definitely do it! And we did the group tour, no private guide, so the price was $110 per person. We only had three other people in our group too. What an absolute dream! The rainbows you have captured are just incredible and being on the edge of such iconic falls is incredible. The tips you have mentioned are also incredibly helpful! Thank you for your nice comment. The day was absolutely perfect! the Falls we amazing! I visited Vic Falls 14 years ago but was way to chicken to do this. Now I’m regretting it! Aww, there’s always next time! We really recommend this adventure, its incredible. It is definitely thrilling and also terrifying at the same time. You should definitely give it a try! I have seen pictures of people doing this and I am not sure I can do it. I am a total chicken when it comes to height. But, what a beautiful and awe inspiring place. I want to see it one day (at least, I will walk around). Wow! That’s impressive. The photo of the rainbow is fantastic. I don’t know if I would have been at ease on the edge like that. Although you say the guide had your back… I’m not convinced yet! ahah! I was totally fine on the edge but my husband seemed to be a little more nervous. We did feel safe while doing it but there was always that shred of doubt that we could just go right over the edge. That sounds amazing! I don’t know if it was possible to do it when I visited Victoria Falls but I never heard about it. Wish I had! You have to go during dry season if you want to try it. Totally worth it! This is something I have ALWAYS wanted to do. I’m trying to make it happen this November. I came here hoping to see cool pics, but as a bonus you answered literally every question I have. I cannot thank you enough. Oh my goodness – I’ve seen the Devil’s Pool on television, and I’d absolutely love to do it, but I think I’d have a meltdown! This has really inspired me, though; I’ll do it someday! There was one person in our crew that backed out last minute. You should totally go through with it, you will not forget it. OMG! This is just absolutely stunning. I’d totally love to sit there in that edge.. I’m sure that would be the best of adventures if I did that! I’m yet to head to Africa, and I’ve no immediate plans too. So that’s gotta wait! You should ad this to your list of must do’s when you make it to Africa. A truly incredible experience. Looks thrilling as you said. So sad I will be there in Apri and won’t be able to do this! I loooove your photos. What a fantastic memory. That is unfortunate that you will not be able to experience the pool. You will however be able to see the Falls in all its glory which will still be incredible! Try and see the Lunar rainbow! This place is so high on my list! Looks so thrilling and glad to hear it is safe. So nice that you had a small group of 6. I love that food was included in this! I hope to go soon. I like your idea of collecting sand! The food was a surprise to us but we definitely took it. The small group made it perfect! Definitely a different perspective of the Victoria Falls. The Devils pool is really life on the edge. What a thrilling experience it must have bee as you clung on to the edge. We have not seen the Victoria Falls yet,but when we do get there, we hope to experience the Devil’s pool. Make sure you pick the dry time of the year or you will miss the devils pool otherwise the falls are incredible to see regardless of the time of year. WOW!! This is absolutely amazing!! Never even heard of Victoria Falls but now its on my bucket list! This pictures are incredible! Great video thanks for sharing! Victoria FAlls has been on my list for a while but I hadn’t heard of Devil’s Poo. But your pictures looks absolutely incredible. I love that you managed to capture the rainbow so perfectly. Their always seemed to be a rainbow when we were there. You should try and see the Lunar rainbow as well! Ooh I definitely want to try this! Although I’m not sure if I’m actually brave enough to follow through! hahah. Such great photos though! 🙂 Thanks for all the details! There was one person that backed out last second but they were still able to enjoy the falls. Even if you back out you can still enjoy almost everything! Ok…it’s official. This is on my bucket list. I really appreciate the attention to detail you put into this post. I read a lot of travel blogs and sometimes they tend to have a “showing off family pictures at Disneyland” sort of feel to them. They just are of the writer telling about their trip. You take it a step further: you give the reader information so that they can learn how to take the trip also. From the pricing to the wet shoes to the recommendation of Tongabezi to the information on going in September I really felt I could just take this blog post and actually place a successful trip to the the Falls. Great job! Wow that’s the nicest comment we have ever received. Thank you so much. We love being able to tell our stories and help others based on our experiences – it’s what made us want to start blogging, so we really appreciate your kind words. We hope you are able to get the full experience you desire at Victoria Falls.